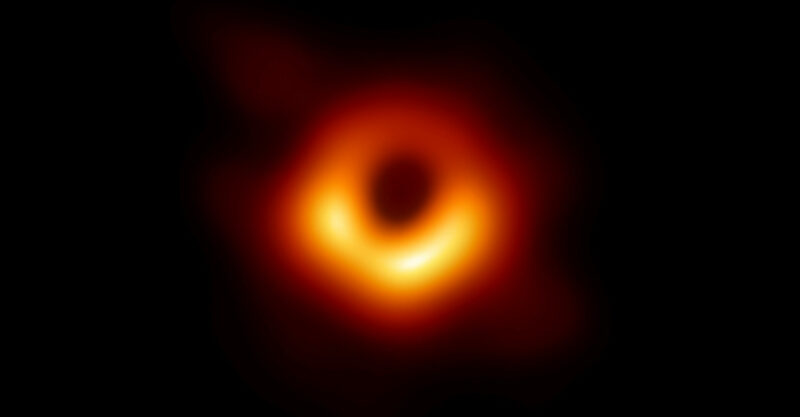 At this historic moment, the world has paused to take in the sight of humanity’s first image of the strangest phenomenon in the known universe, a remarkable legacy of the general theory of relativity: a black hole. I am moved not just by the image; overwhelmingly I am moved by the significance of sharing this experience with strangers around the globe. I am moved by the image of a species looking at an image of a curious empty hole looming in space. I am at the National Press Club, in Washington, D.C., a hive of excitement. Scientists with the Event Horizon Telescope aspired for years to take the first-ever picture of a supermassive black hole, so when they gathered journalists and scientists together today for a press conference, there wasn’t much doubt as to what we were here to see. But still, there are surprises. At the podium is Sheperd Doeleman, the director of the Event Horizon Telescope. He welcomes us, “black hole enthusiasts.” I have the strongest memory of standing at the chalkboard in an otherwise empty classroom at the Massachusetts Institute of Technology with Shep, my funny friend with his funny, unmistakable, burnt-mahogany hair. Covered in chalk dust, we acquired the hard-earned mathematics of Albert Einstein’s theory of relativity. The Event Horizon Telescope’s image of the black hole at the center of Messier 87, a large galaxy in the Virgo cluster. This black hole resides 55 million light-years from Earth and has a mass 6.5 billion times that of the sun.